After some three weeks of simmering at the second-highest alert level of Orange, the Colombian volcano Galeras erupted last night, producing a 10 km eruption column and extensive ashfall. The INGEOMINAS volcanological observatory at Pasto reported ‘an eruption of Galeras volcano of an explosive character’ yesterday evening at 20:37 local time. 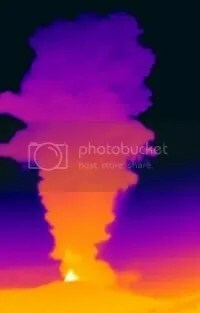 The picture to the left is a thermal image of the plume associated with that eruption (copyright INGEOMINAS: original image is here). The alert level was raised to Red, ‘eruption imminent or in progress’. At 22:53 local time INGEOMINAS published a bulletin on the eruption, which reports that ‘five explosions’ were reported from the town of San Cayetano near the volcano, that the sound waves produced by the event were ‘audible in the form of a rumble’ in various nearby areas, and that ‘the incandescence associated with the eruption was visible for some minutes’. The bulletin also notes that Washington VAAC reported that the eruption plume reached an altitude of around 10 km (see the Washington ash advisory here) and that ash was dispersed mainly towards the north, with ‘reports of ashfall in sectors of the municipalities of Nariño and La Florida and in the Bellavista district of Pasto municipality’. The bulletin reports that the seismic signal of the 20 November eruption ‘had energy levels less than those registered during the eruption of 30 September 2009’, and that since the eruption (and the removal of the solidified material that had blocked the conduit) seismicity has increased in terms both of energy and frequency. Local evacuation and emergency plans have been put into action, although whether those living around the volcano will pay any attention is another matter: 7000 people are affected by the evacuation orders, but only 800 were in the shelters last night, according to local officials.